My 16 month old son chugs water from my glass as we sit and watch my middle son’s football practice on July 19, 2012. Yesterday was the third practice for the Falcons in our area’s pee wee league dispite the blistering temperatures outside. The board has mandated eight hours of conditioning before these young all-stars can suit up in pads for practice so our middle son’s coach has strategically scheduled four, two hour practices this week. Tonight, the five and six-year-olds will fulfill their last hours in the coaches back yard in-ground pool. Last year, this team’s coach was amazing. From the first night with the boys, he gained their respect and attention by firm, yet encouraging coaching. He encouraged team and unity along with hard work and attention to football technique. It was really amazing what he was able to do with such young boys. He actually lead them all the way to be league championships to claim first place! This year he moved up to the next age level with his son but the assistant coach for the team stayed back to coach the other team members who didn’t move up. SWEET! We have had good practices with similar leadership as last year. I can’t wait to see what happens this season with this team! 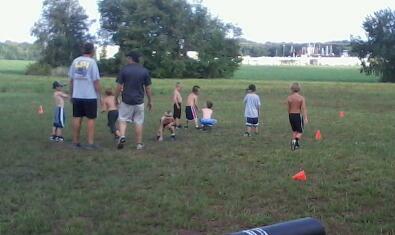 Pee Wee Falcons at the start of their 3rd practice, first practice getting on the line. They worked for about 10 minutes and all of the kids were successfully lining up as if going to war with their coaches. I think this year is going to be just as amazing as last year! The only thing they need to work on is their hustle to and from each play, but honestly, it’s to be expected this early in the year. They are proving to be trainable! That’s awesome! My oldest son was placed on a developmental team this year, the TITANS! He is VERY excited because last year his coaching was lacking. They didn’t get the sweet taste of victory last year, not one time. He wasn’t confident that he wanted to play this year because let’s face it, it’s not fun to lose all the time. Because we want him to be involved in something we encouraged him to give it a go one more time and he is very thankful that he did. Tuesday when I sat in on his practice, I could tell that he had some learning to do. This team is hand selected and trained up to be the best. Never once did I hear any of the coaches shouting or yelling. The boys are there because they want to be. They try hard because they want to be the best. They work hard for their coach because there’s an unspoken respect there. It’s truly amazing! They spent their first practice breaking off into groups containing three to four boys to work on technique. At the first water break, the boys hussled over to their water bottles, filled up and then ran back to the field with a training mission on their minds. This picture was taken after less than a half hour of practice. 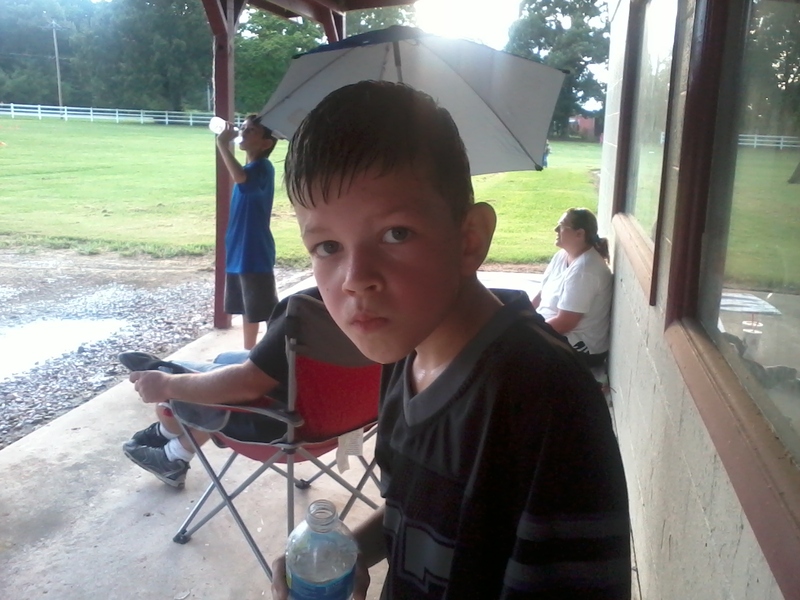 Take note of his soaked head and focus in his eyes! Mouth full of cold water, he takes a minute to rest before going back out for another rotation of drills. I am so proud of my boys. I can’t wait to see what personal goals they blow out of the water, the excitement and pride in their little eyes as they defeat their fears and reservations. I am looking forward to those chili mornings at the football field, the caravans to out-of-town games and the smell of window chalk!